This new hall of residence, designed to BREEAM ‘Excellent’ standards, is located adjacent to Greenwich rail and Docklands Light Railway stations, approximately 15 minutes’ walk from the Greenwich Campus. It provides accommodation for 358 students in a mix of flat shares, studios and “mini-flats”. The University, located in the grounds of the former Old Royal Naval College, but also with other facilities at Avery Hill and Medway in Kent, is the largest university in London by student numbers, with almost 24,000 students. Its wide range of subjects includes architecture, business, computing, education, engineering, humanities, maritime studies, natural sciences, pharmacy and social sciences. It also has a strong research focus and well-established links to the scientific community. To control access to and within Daniel Defoe Hall the University has chosen a SALTO access control system which has been supplied, installed and commissioned by SALTO Certificated Partner Guardian Security SW Ltd.
David Wileman, Sales Manager for Guardian Security SW Ltd, says “SALTO access control is already the system of choice for the university being widely used across campus. This includes in their £76 million Stockwell Street development which is another brand new building but open to the public, and the new base for Architecture, Digital Arts and the campus Library, and purpose designed as an access controlled environment. 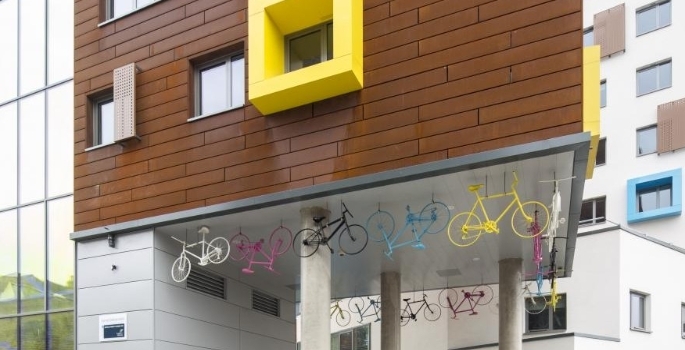 At Daniel Defoe Hall the brief was to think of the student accommodation as a hospitality environment and so we were invited by the client to write the specification based on the SALTO Aelement range of escutcheons. The advanced SALTO data-on-card access control system allows users across campus to control the building through its offline escutcheons in almost real time through the SALTO Virtual Network (SVN). This software allows the battery operated stand alone locks to read, receive and write information via their operating ID smart cards. Data is captured from the cards at SVN on-line hot spots located at strategic points which upload and download user related information that is then used to permit, control or deny access. Sandeep Singh comments “Living in halls is an exciting experience and a great way to meet new people and make lifelong friends. It provides an opportunity to get involved in university life and feel part of the student community. But it is important that while doing so students are safe and secure and that access to our new Daniel Defoe Hall is strictly controlled.